If you have been following my blog, you know that I have been very happy with my workstation running XP64. It has been stable and over the past, 5 years, it never crashed. When Microsoft first announced Windows 7, I had no real intention of upgrading my workstation. But, I did buy the Windows 7 upgrade when Amazon had the $100 off promotion … just in case. Well, that “case” happened this week when I received my Adobe CS5 Master Collection. After looking at the literature, it clearly stated that Premiere CS5 and After Effect CS5 would NOT support XP64 even though it is a 64-bit operating system. Adobe decided to only support Vista 64 and Windows 7 64. All other operating systems would have to run the older CS4 versions of Premiere and After Effects. Windows XP64 has long been the disowned child of Microsoft, even though it was a close cousin to Vista 64. As long as Vista 64 was supported, my XP64 workstation was just fine. Whether it was laziness by Adobe or the pending death of XP, my stable XP64 was suddenly on its way out. I have two RAID arrays on my workstation: one is a RAID1 boot array and the other is a 1-terabyte RAID1 data array. I wanted to wipe out the boot hard drives to start clean, but I needed to protect my data hard drives array. I started the 2-day task of backing-up the data to DVD DLs. I actually ran out at one point – that’s a lot of data! With the back-up completed, it was time to start the Windows 7 upgrade. Now, I have upgraded PCs before and a clean install has always been the preferred method. It does force you to reinstall you programs, but it was always the most stable environment for Windows. I assumed that it would be the same for Windows 7. 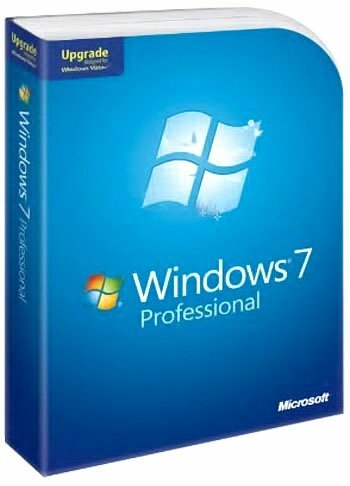 In fact, the back of the Windows 7 box clearly states that “If you are upgrading from Windows XP, you will need to back up your files and settings, perform a clean install and then re-install your existing files, settings, and programs.” What the box did NOT say was that Windows 7 does NOT like being installed on a 5-year old RAID device. Since I have two RAID devices in this workstation, I want to research as much as I could before starting the process. I first called Microsoft. Even though I purchased the Windows 7 Professional upgrade, Microsoft does not train their dedicated Windows 7 Upgrade Team on RAID devices! I placed several calls to the Windows 7 support line and received a wide range of responses from their off-shore team. In fact, one Microsoft rep actually recommended that I disconnect the 1-terabyte data array before I started the upgrade! When I told him that disconnecting the RAID device could damage the array and make it unstable (or unusable), he put me on hold for about 10-minutes. After consulting with his “team”, he agreed that disconnecting it was not recommended. Hmmmmm …. In fact, the best advice Microsoft had for me was to call Dell. Download the latest HostRAID Controller from Dell and unzip the files on the boot drive. During the clean install, Windows 7 will stop and say that it cannot find the driver for the boot RAID hard drive. It will ask you to provide the correct driver. I just pointed Windows 7 to the location of the unzipped Dell drivers and selected the appropriate driver. The installation continued. Windows 7 upgrade will not format your hard drive. Instead, it will move all old program files to a directory called Windows.old which can simply be deleted. You will still need to look for other stray folders, but it actually did a very good job at tidying things up. After the installation completed and Windows 7 started for the first time, you will need to enter a few commands to force Windows 7 to continue to use this old non-Windows 7 driver. From this point on, Windows 7 has been working perfectly. I installed Adobe CS5 Mast Collection and actually noticed a real performance boost in Photoshop CS5. As for the 1-terabyte data array, I just installed the Windows 7 driver for it and found all of my data intact! More on Adobe CS5 next week! since a RAID 1 is mirrored it is more than ok to disconnect the drives during install, or at any other time for that matter. Worse comes to worse, even if one of the drives becomes corrupted, or if the array gets an error, it’s simple enough to rebuild the array by copying one disk to another – that is the whole purpose of a Mirrored RAID. RAID 0 on the other hand is a different story. Do you have any idea how long it took to initialize the 1-terabyte RAID??? It took hours for it to format blank drives! That is not something I would want to repeat, especially if there is data involved. understood – but the RAID instructions take place at the BIOS level – not software. Disconnecting the drives does not do anything to alter the array. Once they are reconnected the RAID controller goes right back to business. I have even done this with RAID 0 arrays. As long as you don’t alter the drives while they’re disconnected, nor alter the array setup, there is nothing to worry about. When I do fresh installs, I always disconnect all drives except for the install drives and then reconnect them after installation is complete. I happen to do a fresh install every 6 months or so, so I am very comfortable with this practice. In any event, it worked out fine for you, so it’s moot – but just something for you and your readers to think about next time they do a freshie. every 6 months for a fresh windows install. I don’t ever have to rebuild the data ever since I keep all the data on separate drives form the OS. If you keep all you apps on a hard drive in one place and have you backups in order, doing a fresh install and getting back up and running only takes about 2 hours – installing apps from a hard drive is exponentially faster than installing from cd’s. I think Windows 7 installs seem to last longer and stay fresh, though. I haven’t experienced bloated windows load times & performance degradation over time as with previous OS’s so the “every 6 months” should stretch out longer (I’m hoping). Good to know. Thanks for the follow-up. So far, I am also impressed with Windows 7 especially when running the new Adobe CS5 programs. Thanks for these information. I’ve got the same problem than you, trying to install (from crash) Windows 7 Pro 64 bits on my Dell Precision 670, with a SATA hard drive. Where do you found that hostraid controller driver for windows 7 64bits ? I downloaded one from dell but it does not work, probably because this a windows XP / 2000 driver. Check the two threads listed in the article. The bad news – my RAID crashed twice after deleting over 500GBs and I have since given up on Raid. I replaced one drive and are running them now as single drive. I did install a DL Blu-ray burner for backing up.